Pentagon officials hailed the Trump administration’s plan to spend $14.1 billion on national security space programs in 2020 as a bold but necessary move to preserve and strengthen U.S. military dominance. 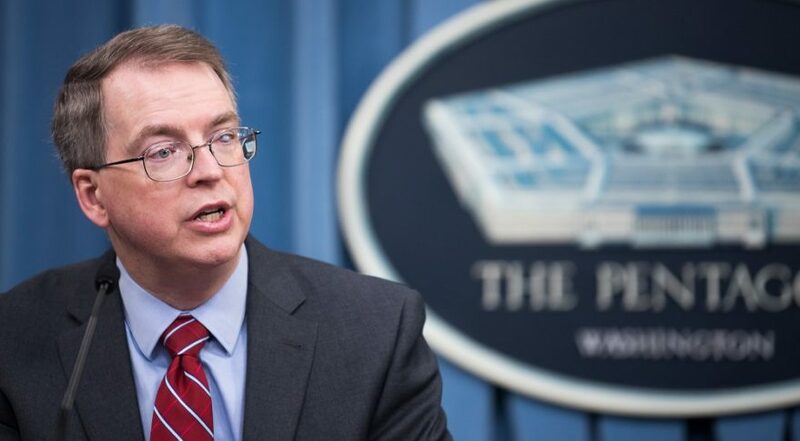 “Future wars will be waged not just in the air, on the land or at sea but also in space and cyberspace, dramatically increasing the complexity of warfare,” David Norquist, acting deputy secretary of defense, told reporters following the rollout of the Pentagon’s budget March 12. Norquist said budget priorities were shaped by the administration’s National Defense Strategy, which emphasizes strategic competition with China and Russia. The space investments, he said, support the military’s transition to a more resilient architecture that allows forces to operate in a contested environment. The funding request for space is part of the president’s $750 billion proposed budget for national defense — $718 billion for the Defense Department and $32 billion for national security programs performed by the Department of Energy’s nuclear laboratories and other agencies. The lion’s share of the space budget proposal, about $13.8 billion, is for space programs primarily overseen by the U.S. Air Force. An additional $306 million is for standing up three new organizations: U.S. Space Force, U.S. Space Command and the Space Development Agency. 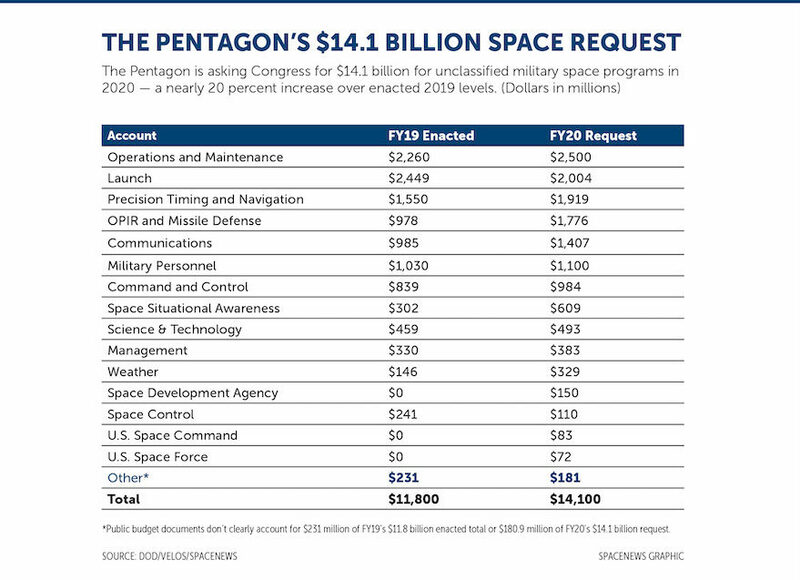 In total, DoD is seeking a 19.5 percent increase for space, or $2.3 billion more than the $11.8 billion Congress enacted for 2019, according to Air Force budget deputy Carolyn Gleason. Russell Rumbaugh, senior budget analyst at the Aerospace Corp., said that while certain portions of DoD’s space budget are in the public domain, those records are not comprehensive and not easily recreated or traceable over time. “Furthermore, current efforts to reorganize space are likely to result in new ways of thinking about what should comprise the defense space budget,” said Rumbaugh. The $14.1 billion space request, like everything else in the Pentagon’s budget, is far from a fait accompli. Democrats already have rejected the proposal for shifting $165 billion of the $718 billion DoD budget into the war operations account known as Overseas Contingency Operations (OCO) and for setting aside $3.6 billion of military construction funds to help build a wall along the U.S.-Mexico border. The OCO gambit allows the Trump administration to keep DoD’s base budget request at $576 billion — the limit set by the Budget Control Act — and still dramatically increase defense spending without having to cut a deal with Democrats, who would demand a matching increase for non-defense agencies. OCO is not subject to Budget Control Act spending caps Congress imposed in 2011 to resolve a debt-ceiling crisis. The Pentagon acknowledged that $98 billion of the $165 billion OCO request is for “base requirements” that support the National Defense Strategy but are not war-related. The space request includes $10.2 billion for space investments, a broad category that includes both research, development, test and evaluation (RDT&E) and procurement. The more notable expenditures proposed for 2020 are for a new constellation of missile-warning satellites known as Next Generation Overhead Persistent Infrared (Next-Gen OPIR); for the GPS 3 constellation of positioning, navigation and timing satellites; for national security launch services; and for the development of future satellite communications systems. The Air Force is requesting $1.4 billion in RDT&E funds. That includes $817 million for the development of three Block 0 geosynchronous missile-warning satellites being built by Lockheed Martin under a $2.9 billion sole-source contract awarded in August, $107 for two polar-orbiting satellites to be made by Northrop Grumman under a much smaller contract, $264 million for ground systems and $205 million for studies of future parts and material obsolescence. The Air Force projects large funding increases for next-gen OPIR over the next several years to accelerate the program: $2 billion in 2021, $2.2 billion in 2022, $2.6 billion in 2023 $3 billion in 2024. 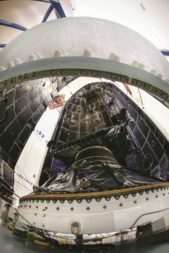 Next-gen OPIR will replace the legacy Space Based Infrared System (SBIRS) satellites Lockheed Martin has been building for decades. The first Block 0 GEO satellite will be fielded in 2025 and the first polar satellite by 2027. All five Block 0 satellites need to be on orbit by 2029. The budget also seeks $233 million in procurement funds for SBIRS, to fund launch integration and early on-orbit testing for the GEO-5 and -6 satellites. The budget includes $462 million for the development of the GPS 3 follow-on satellites, or GPS 3F, to be built by Lockheed Martin under a $7.2 billion contract awarded last year for up to 22 satellites. There is also $414 million for the procurement of the first GPS 3F in 2020. 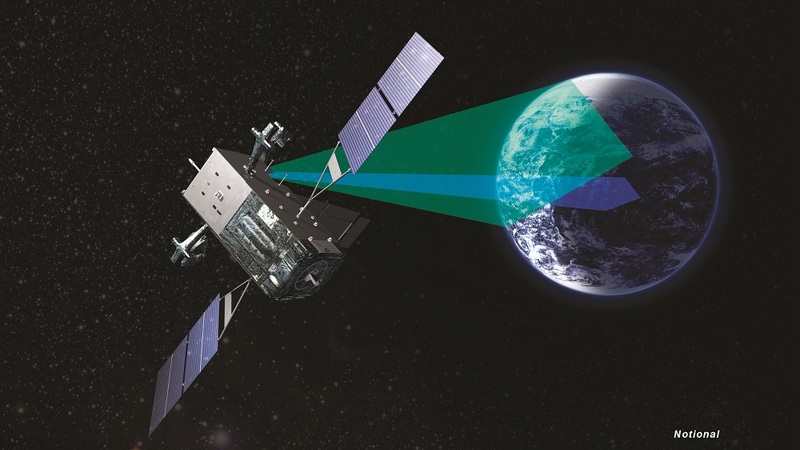 The Air Force projects spending $3.8 billion on GPS 3F through 2024. It will procure two satellites in 2021, three in 2022, three in 2023 and three in 2024. According to the Air Force, the GPS 3F satellites provide the same services as the GPS 3 satellites that already are in production but have improved capabilities to deliver high-power Military Code (M-Code) signals. Lockheed is currently building 10 GPS 3 satellites the Air Force initially ordered in 2008. The first GPS 3 satellite launch in December was on a SpaceX Falcon 9. The second GPS 3 is slated to launch in July on a Delta 4. The 2020 budget seeks $31 million for technical assessments of the production of vehicles 3 through 10 and their preparation for launch. The budget also has $329 million in RDT&E funds for GPS user equipment, with an additional $400 million projected from 2021 through 2024. User equipment consists of receivers, antennas and electronics to derive navigation and time information transmitted from GPS satellites. There is $380 million in RDT&E funds for the new ground control system for GPS 3, called OCX, plus $64 million for the integration of OCX into the GPS enterprise. Raytheon is the prime contractor. The Air Force projects to spend an additional $1.2 billion on OCX from 2021 to 2024. The request for satellite communication funds the recapitalization of the Northrop Grumman-led Enhanced Polar Satcom system ($427 million) and for Boeing-built Family of Beyond Line-of-Sight Terminals ($197 million). The budget also seeks $174 million to accelerate the prototyping of a Protected Tactical Satellite Communications (PTS) system. The Air Force is developing a Protected Anti-jam Tactical Satellite Communications family of systems, one of which is the PTS, designed to operate in contested environments using the Protected Tactical Waveform. PTS includes a space segment, ground segment and gateway segment. The budget includes $105 million for the PTS ground system called the Protected Tactical Enterprise Service, or PTES, being built by Boeing. Initially PTES will use the Wideband Global Satcom system and be expanded later to include commercial satellites and the PTS system. To develop a future replacement of the Advanced Extremely High Frequency strategic satcom system, the Air Force is seeking $172 million for the Evolved Strategic Satcom program. ESS will support strategic missions such as presidential, nuclear command and control strategic communications. 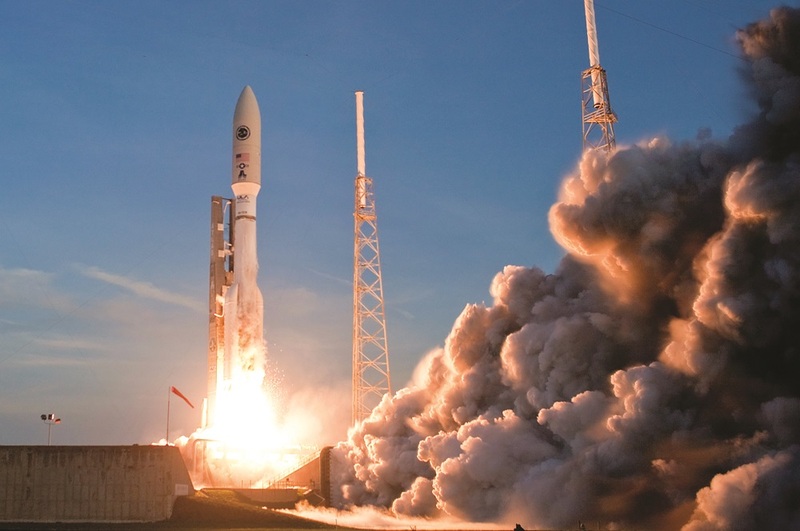 The Air Force is requesting $1.2 billion to procure four launches under the program that used to be called Evolved Expendable Launch Vehicle and was renamed National Security Space Launch (NSSL) per congressional mandate. The budget also seeks $432 million for development of next-generation vehicles. Air Force NSSL launches will be slowing down over the coming years. According to the budget projections, only one launch is planned for fiscal year 2021, two in 2022, three in 2023 and four in 2024. Projected RDT&E funding is $561 million in 2021, $287 million in 2022, $221 million in 2023 and $87 million in 2024. The Air Force is responsible for funding its own missions. Other NSSL launches are funded by the National Reconnaissance Office and the Navy. The RDT&E investment is for Launch Service Agreement public-private partnerships awarded last fall to Blue Origin, Northrop Grumman and United Launch Alliance for the development of new launch systems. The budget creates a new funding line for the Enterprise Ground Services (EGS) program, with a $138 million RDT&E request. The EGS will become the primary ground command-and-control system for Air Force space systems. Legacy ground systems over the next decade will transition to the EGS architecture. The EGS is expected to support 23 missions, including missile warning, missile defense, satellite communications, space domain awareness and other experimental satellites. The Pentagon officially established the SDA on March 12 under the authority of the undersecretary of defense for research and engineering. The SDA was created to accelerate the development and fielding of new military space capabilities. DoD is requesting $44.8 million for staffing, $20 million to develop a proliferated low Earth orbit sensor network, $85 million for space technology development and prototyping, $15 million to develop transport layer architecture and standards, $10 million for commercial procurement of space situational awareness and launch of small satellites in LEO, $30 million for LEO missile warning ground integration, $15 million for a space-based interceptors study and $15 million for a space-based discrimination assessment.